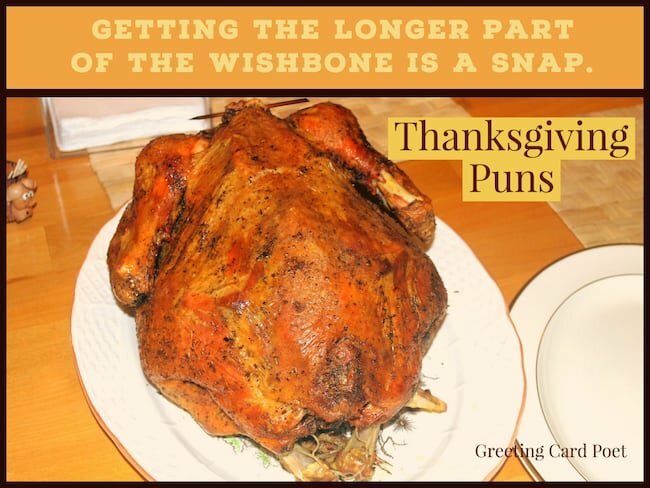 Our Thanksgiving puns make light of what many consider to be the most American of all holidays. We get together with friends and family, we eat, watch some football, we eat some more, and maybe, just maybe get in a little post-meal exercise. Oh, and one more thing – the most important – we express our gratitude and give thanks for all of our blessings in life. One of those blessings is the ability to laugh at ourselves. Getting the longer part of the wishbone is a snap. Don’t feed the turkey, it’s stuffed. Gobble, Gobble, until you wobble, wobble. It doesn’t get any butter than this. It’s all fun and games until the pants don’t fit. I’m all about the baste, about the baste. The dinner doesn’t stop until I’ve tried everything. You ain’t seen stuffing yet. Thanksgiving is a time to count your blessings, not your carbs. Baby, I’m a maize at the way you feed me. Don’t forget to set your scales back 10 pounds tonight. Don’t be a jerky, eat some turkey. Oh my gourd, I love Thanksgiving. What do you get if you divide the circumference of a pumpkin by its diameter? 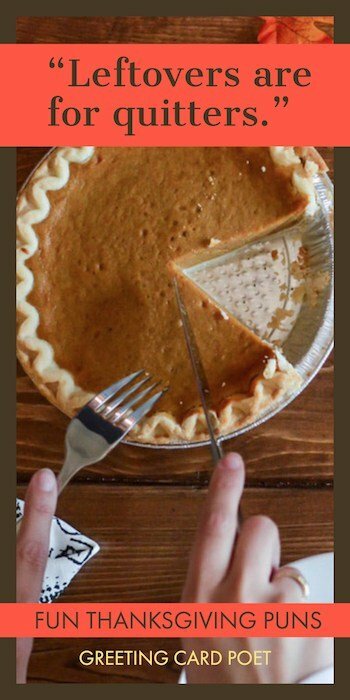 Pumpkin pi! Popeye’s Thanksgiving thought: I yam what I yam. Go ahead, bake my day! Learn more about the inside story of Thanksgiving’s History. Clear eyes, full stomach, can’t lose. You miss 100% of the leftovers you don’t eat. What is the key to a great Thanksgiving meal? What does a turkey drink from? 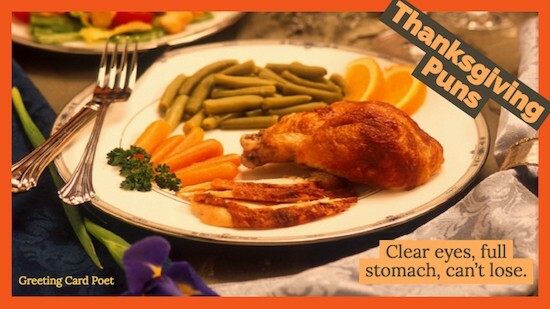 I’m giving up leftovers over time because I can’t quit cold turkey. What do you get when you cross a octopus with a turkey? Where did the turkey learn to dance? Thanksgiving = Not a good day to be my pants. Black Friday purchases need to take in account the weight you gained on Thursday. What did the pilgrim call his home boys? Why doidn’t pilgrims tell secretes in the corn field? What happened to the pilgrim who was wounded by the Indian? If pilgrims were alive today, what would they be most famous for? More Fun Thanksgiving Jokes and Humor. Put your fat pants on…it’s time to eat. There’s a place for all of God’s creatures – next to the potatoes and gravy. Call the girls, call the guys, we’re having peas, potatoes and pumpkin pies. People dress up on Halloween, we dress turkeys on Thanksgiving. The day after thanksgiving is the busiest day for plumbers. Eat, drink and wear stretchy pants. Don’t run a fowl of the cook! Ah, the life of pie. Families are like peanut brittle, it takes a lot of sweetness to hold the nuts together. 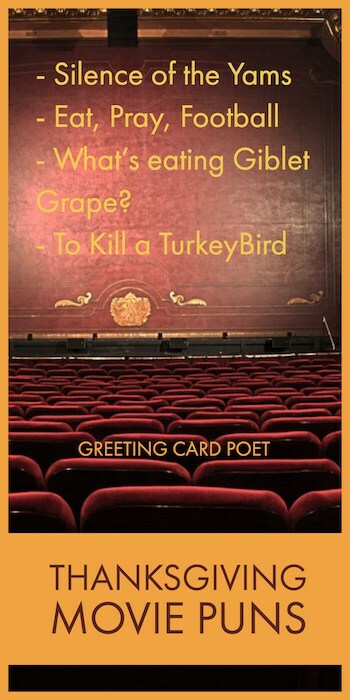 What does a turkey with one leg say? Why were the fans tired of the turkeys’ baseball team? All they hit were fowl balls. An American Turkey in the Oven. A Sweet Potato Named Desire. When the turkey was told he would be surrounded by family for the holiday, it wasn’t necessarily a good thing. How to diet on Thanksgiving: Don’t! The thing I’m most thankful for: Elastic Waistbands. Thanksgiving dinner: How people used to communicate before social media. Dear Christmas, Wait your turn. C’mon man! I was thinner before Thanksgiving dinner. 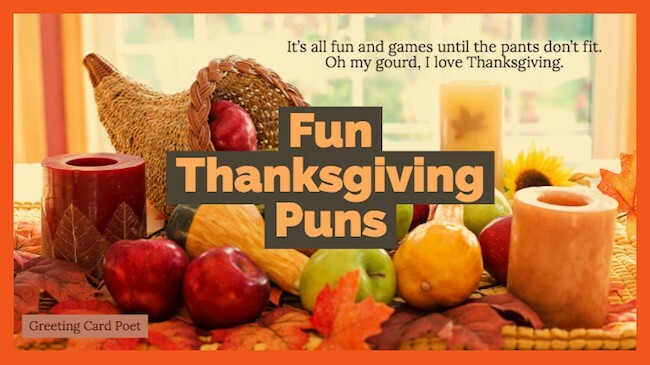 You’re on Thanksgiving Puns page.